← A BD Top Tweeter? 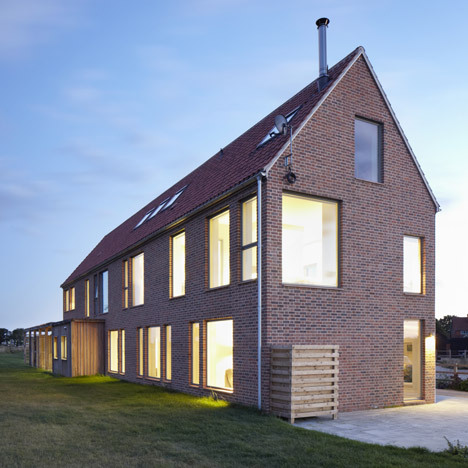 The Long Farm in Suffolk by Lucy Marston Architect has received a lot of coverage following its selection as Grand Designs Home of the Year and shortlisting for an RIBA Regional Award. The best freely accessible coverage is on the ever-excellent DeZeen (here) supported by some beautiful photos from Jack Hobhouse. The resonances with some of what I’ve been saying on Ruralise are obvious, particularly the discussion of the ‘Wide-Fronted House’ and ‘Roofs Across Fields’ – though in the context of the latter it’s a bit disappointing that there isn’t a longer distance view of the house in its wider landscape context. And then I came across the website of Herring Homes. I can’t tell you much about them because the website, whilst packed with juicy projects is otherwise incredibly opaque and difficult to use (sorry, Mr Herring!). The ‘modern barn’ at Bere Leys in Tidmarsh is well worth the effort though – particularly for its spectacular thatched roof. (Viewing stats reveal that Ruralise readers have found my ‘Thatch-Fest’ posts of particular interest). Whilst I really like both houses, both are definitely in the ‘grand designs’ category, so don’t really help in my quest to promote a better ‘every-day’ architecture for the rural setting. More on ‘Rural Simplicity’ starting here. This entry was posted in Architecture/Design and tagged Bere Leys, design/architecture, Grand Designs, Herring Homes, Long Farm, Lucy Marston, roofs, rural archetypes, simplicity, thatch, wide-fronted house. Bookmark the permalink.